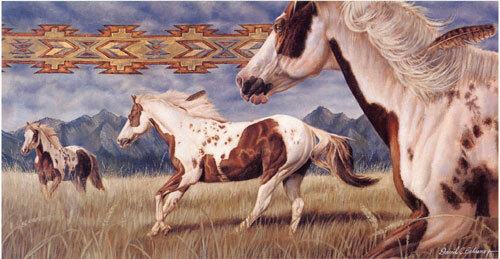 Accentuate the Native American or western or southwestern theme of your home with breathtaking art by David C. Behrens. 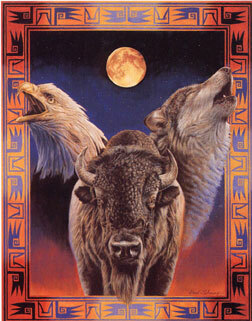 David uses dream like images to depict the symbology and magic of Native American Indian life. Pictured above is Spirit of America. Prints are available in Limited Edition Print Framed or Open Edition Framed. Open Edition Framed prints are $95.00. Limited Edition Print/Artist Framed Proofs are $467.50. Limited Edition Print/Artist Proof Prints are available in Frame style A (shown below on left), which is made from solid barn wood. The first mat has a light leather texture. 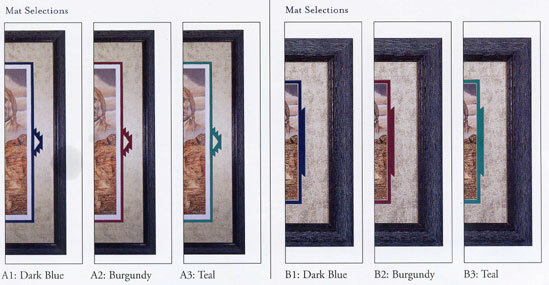 The second mat comes in three available mat colors: blue, burgundy and teal. The Open Edition Prints are available in Frame style B (shown above on right). Framed size is 11 x 14 inches. The frame is constructed from solid barn wood. The first mat has a light leather texture. The second mat is available in three colors: blue, burgundy and teal. Each print comes with an artist's biography and description. Limited edition prints come with a certificate of authenticity. Reserve yours today!